I don’t know about you, but pretty much everything feels better when I have a big old mug of hot chocolate in my hands. And what makes me feel even better is when that hot chocolate is actually going to be supporting my body with real food, unprocessed sweeteners and maybe even some adaptogens (herbs that support our body’s stress response and help bring systems into balance). This time of year has me jonesin’ for a warm drink in my hand at all times. It also tends to increase stress levels by way of lots of social engagements, busy shopping everywhere, crowded parking lots, heightened emotions, rampant germs, etc. I’m all about food as medicine (in case that wasn’t abundantly clear by now) so I really like my foods and beverages to be functional. And I also want them to taste damn good. 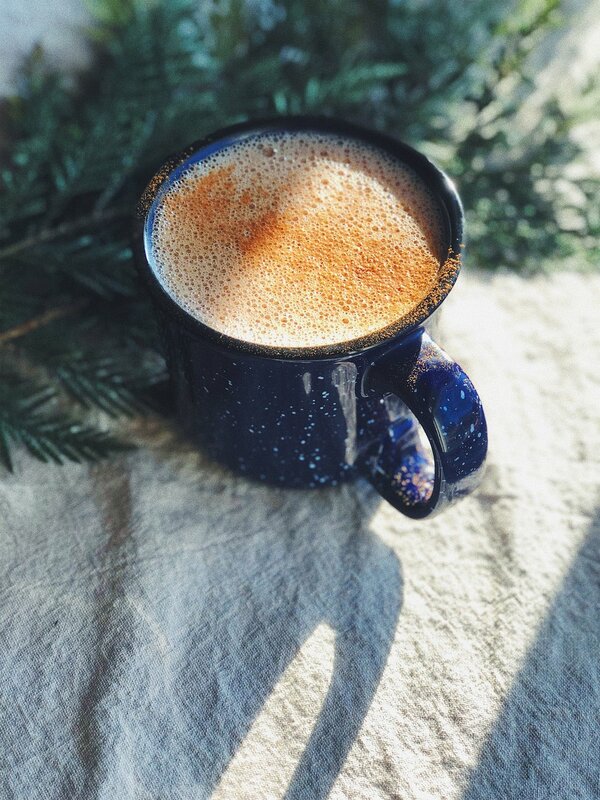 And so I present you with this Mood Boosting Hot Chocolate, specifically crafted for the holiday season (because honestly, when else do you drink hot chocolate?). Cacao has huge mood-boosting benefits - it stimulates the release of endorphins, it contains tyrosine which is a precursor to dopamine, and is actually incredibly good for your brain. Dates contain magnesium, which is a mineral known to be relaxing and which is easily depleted during times of stress (and which 80% of Americans don’t get enough of). I’d recommend using milk with a little bit of fat in it (or add a teaspoon of coconut oil) since fat is essential for brain health. This basic recipe is all you need to kick back with a relaxing hot bevvie, but you could further boost the de-stressing properties with any of the optional add-ins I’ve listed. Beside each I let you know what the main affect on mood or stress is. collagen - supports gut health, will make your drink extra foamy! Add non-dairy milk, cacao powder, date, salt and any other add-ins you desire to small saucepan over medium heat. Gently warm until it’s to your preferred drinking temperature. Transfer to a blender and blend 30-60 seconds, until date is totally incorporated. Pour into your favorite mug, get cozy doing something that relaxes you and enjoy! If I don’t have non-dairy milk around (which is more often than not) I use either 2-4 tbsp full fat coconut milk or 1 tbsp coconut butter + water. Mountain Rose Herbs is where I get most of my herbs and superfoods. These are the vitamin D drops I recommend. They’re flavorless and I love adding them to these sorts of drinks since fat helps our bodies absorb the vitamin D.